I grew up with fresh ricotta in my Nana's kitchen! I just love the combinations in my ricotta frittata to enjoy anytime of the day. Here is the video we shot with this recipe! go here..
Heat a large oven proof pan over medium-high heat then add in olive oil. Once hot pour in egg mixture. Let cook for about 3 minutes until the bottom starts to firm. Add in your preheated oven and bake for about 12-15 minutes or until the center is firm. Drizzle with extra virgin olive oil and top with remaining fresh herbs. 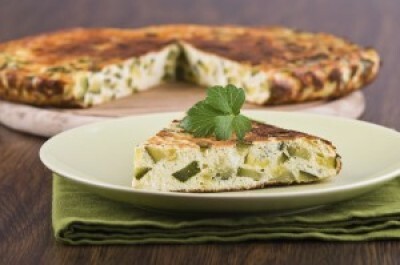 Note: This frittata can be served hot or warm and for any meal throughout the day!